There are some cities that are simply magical. Places where, from the minute you first set foot on the ground, you are instantly in love and know you want to linger. Where first impressions are both exhilarating and angst-filled with an excitement to explore, yet also a panic with the knowledge you’ll eventually have to leave. I’ve been fortunate enough to find these places all over the world in cities like Edinburgh, Scotland, York, England, San Gimignano, Italy, Munich, Germany, Perhentian Islands, Malaysia, McLeod Ganj, India and even in my own state in Ann Arbor and Mackinac Island, Michigan. And now after two months in China I’m happy to add one more to the list: Yangshuo, China. Just a small town an hour and a half out of Guilin, Yangshuo is a charming backpacker’s haven full of pedestrian streets, Chinese architecture, cozy restaurants and enough outdoor activities and courses to keep you occupied for weeks. But the town’s most stunning feature is its natural scenery. The minute you get off the bus to the city, your jaw drops as you stare at the massive limestone cliffs that encompass it throughout. These karsts are so close that they literally hover over the streets like protective guards you can go up and touch. Aside from providing an incredible backdrop, the karsts also provide lots of opportunities for outdoor exploration including beautiful bike rides, hikes and my new favorite: rock climbing. My two-turned-five days in Yangshuo were some of my favorite in all of China and I took well advantage of the activities offered. The cycling around Yangshuo was perhaps the best bike ride I’ve ever been on. The ride through the countryside takes you along the river through a series of small villages, between the karsts on one side and the rice paddies on the other. Absolutely stunning scenery! 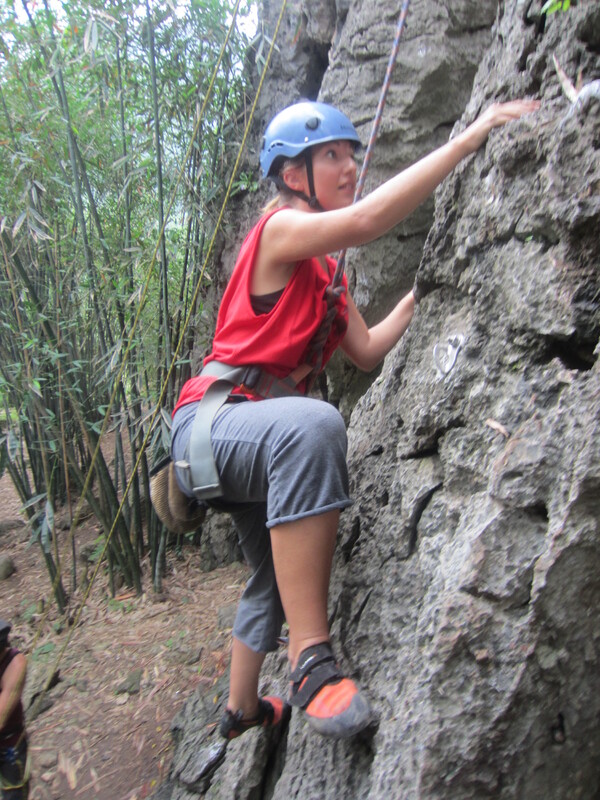 Rock climbing was a new experience for me and one that I found strangely meditative. Something about hanging in the air, clutching to the side of a rock cliff has a very focusing effect, and I found my mind completely concentrated on not falling. Half-way through I remember thinking, “I’m never doing this again,” but sure enough, I went up nearly three times! What a rush! While I’m not a big fan of needles, I decided to try acupuncture as a stress-relieving technique. The whole process took 40 minutes: 5 minutes to insert the needles, and another 35 holding still, letting the needles do their work. I did not find the insertion of the needles particularly painful, but I soon learned that when the acupuncturist says, “hold still” she means it! Honestly, I found my anxiety levels rise during the process, since I wasn’t completely comfortable with the idea of having eight needles stuck in me as I sat alone for more than a half hour (anyone else seen Final Destination 5?). But I will say that I did feel much calmer afterward. But who knows, maybe just sitting still for that long will calm anyone down? In India, I do yoga. In China, martial arts? I decided to try Kung Fu after meeting a nice Bruce Lee-looking man in town who not only gave me lessons, but helped me to book my next train ticket and invited me to dinner with his friends. I can’t say I learned much during my hour-long lesson with him, but I did learn a fairly cool “dance” routine, which was pretty fun. I’m pretty sure Yangshuo just might be my favorite place in all of China ;). karst formations, along with other spectacular characteristics such as natural bridges, gorges and large cave systems. been inscribed for its giant dolines (sinkholes), natural bridges and caves.